Whether you're traveling to Greece, France or visiting family, nothing says "cultured relaxation" like a crisp glass of wine. But when the trip is over and it's time to make the long journey back home, wouldn't it be nice to bring some of that delicious vino back with you? If only glass bottles weren't so fragile, right? While you can't replace the material of your wine bottle, you CAN protect it with the Winevinci Wine Protector. Double The Protection: Our wine bags contain 2 layers of quality cushioned bubble wrap, offering twice the protection of a regular wine protector. But don't worry about added bulk or weight in your luggage - we've kept the design slim and lightweight with your travel restrictions in mind! Good For The Environment, Good For You: Using a new wine protector every time you travel just adds to the landfills. Cut down on waste - and costs - with one reusable wine bag. Our bags are sealed with a zip-lock and Velcro system, so they're good to go again and again. Built-In Plan 'B': With our double-layered bubble wrap, it's unlikely that your wine bottle will break. However, we know that bad things happen to good wine, so we made sure our bags have tight seals that prevent leakage. Now you can take your bottles anywhere, without any unpleasant surprises waiting for you at your destination! The Coolest Wine Bottle Protector Around: Nothing says "valuable contents" like our sleek black and white design. Don't just present your wine intact - present it in style! 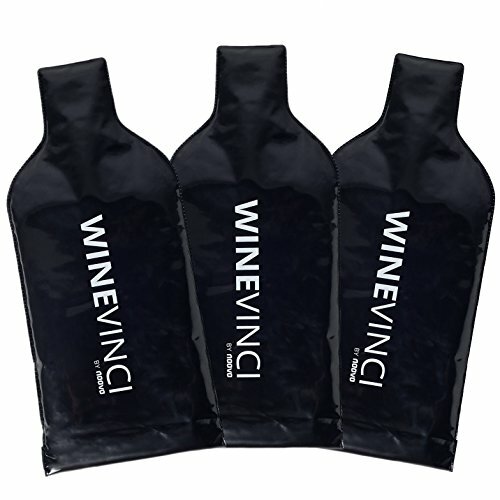 Pack of 3 Wine Bottle Protectors: Our bottle protectors come in convenient packs of 3. Give one as a gift, or keep them all to yourself! Full Money Back Guarantee: We're confident that you'll love our product but if you're not 100% satisfied, contact us and we'll refund or replace your wine protector. TRIPLE LAYERS OF PROTECTION: Transport your wine with peace of mind. Our wine bottle protector contains two layers of quality bubble wrap while remaining sleek and lightweight. Enjoy the best protection on the market without extra bulk or weight in your suitcase! USE AGAIN AND AGAIN: This reusable wine sleeve is ready to save your wine from breaks and leaks over and over. The bag is sealed with a double zip-lock and Velcro system, no flimsy glue seals. Designed by wine-loving travellers, it is accepted to use in checked luggage on airline trips. Bring it on holidays, vacations and casual trips - it's your new wine saving companion! PROTECTS TWO WAYS: Designed to take hits, the WINEVINCI contains two cushioned layers of bubble wrap sealed inside an industrial-grade PVC bag. In the rare case of bottle breakage, your wine won't leak out of our zip-lock and Velcro seal system. No unpleasant surprises or spilled luggage! HIGH-QUALITY ELEGANT DESIGN: Have your wine travel in style. Our high-quality branded black bags combine function with fashion, making them the perfect gift for traveling wine-lovers. Give your friends your souvenir bottles gift-wrapped in WINEVINCI bags - or give a pack of protectors as a practical gift for travelling wine enthusiast! PURE QUALITY - NO CRAPPY BONUSES AND "GIFTS": We wanted to make the best product possible - a protector that stands out because of its quality and style. We don't need to add cheap gifts like cork screws and ice bags that you probably already have. The best quality on the market without compromises - guaranteed with unlimited warranty! If you have any questions about this product by Naava, contact us by completing and submitting the form below. If you are looking for a specif part number, please include it with your message.